The heating system in your Nissan vehicle was designed to keep you warm while ambient temperatures are cold. The engine cooling system is also linked to your heating system. If your heating system is not working properly, it is essential to get it fixed because it can cause the cooling system to malfunction. If there is a problem with either your heating or cooling system, the consequence can be an overheated engine with expensive damages. There are a few major components that make up your heating system that must be inspected to ensure that they are functioning properly. Those parts include the heater core, blower fan, hoses, pressure cap, and heater control valve. The air conditioning system cools the air and removes moisture to help you stay comfortable while driving when it’s hot outside. The system is complex with many parts that require inspection, repairs, and replacement as needed. When you receive Air Conditioning System Service with one of our expert technicians, they will know to inspect all system parts including the compressor, expansion valve, evaporator, pulley, and refrigerant to ensure that the cooling system is operating at factory specifications. The Heating and Air Conditioning Systems use the ventilation system to disperse the air. Just as heated air exits the vents to keep you nice and warm through the winter, the vents also deliver air-conditioned air that keeps you nice and cool during the summer. All of this work can make the ventilation system really dirty, especially if you’ve driven much in dusty air or on unpaved roads. Every Nissan HVAC Service includes an inspection and cleaning of your ventilation system to restore it to factory specifications. United Nissan is conveniently located in Las Vegas within driving distance of Spring Valley and Paradise. If you have any kind of HVAC problem and live in our area, then we welcome you to take advantage of the region’s finest Nissan HVAC (Heating, AC & Ventilation) Service. 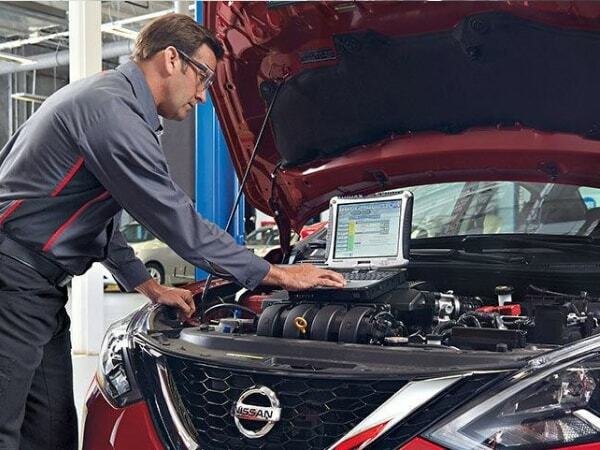 Gain peace of mind with every automotive service at United Nissan because we guarantee that your job will be completed by an expert technician that only installs genuine fluids and replacement parts.